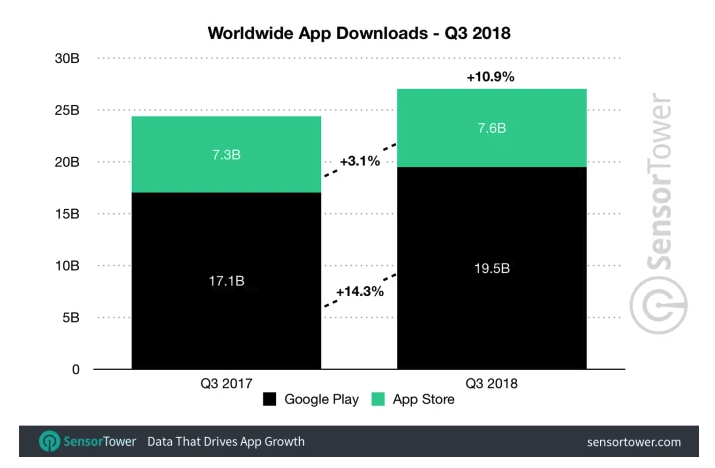 There is some good news coming out from Q3 2018: the App Store generates almost double the revenue made by Google Play. Not only it makes more money, but the App Store revenue is also growing at a higher rate than Google Play’s generated income. This discovery is extremely important since it shows where the money really is for mobile developers and tech entrepreneurs. Sensor Tower released a set of new reports for Q3, outlining the fact that App Store made $12 billion in the quarter, up 23.3% year over year. The competing store, Google Play generated only $6.2 billion, up 21.5% from the year-ago quarter. While the news is not surprising, these numbers represent a major argument on why tech entrepreneurs and engineers should focus their energy on building iOS apps first, rather than Android properties. The iOS ecosystem penetrated the highly developed countries extremely well and that’s where the money comes from. In order to maximize your odds for success, it’s pretty obvious you should tackle the “rich” market first. As an extra argument supporting that, iOS users’ median income is $85.000 per year, while an Android user earns $61.000 per year on the same scale. An interesting fact is that Android apps have had more downloads than iOS apps in the same quarter. This makes sense, given the rapid adoption of lower-end Android devices in emerging markets, but it represents a reason to make an Android app first only if the number of downloads is the most critical business metric for you (as opposed to revenue). What can’t we extract out of these numbers? It’s hard to tell if these numbers justify the use of Swift over React Native in iOS development. This really depends on your available resources and the market your business is targeting, but for sure you want to prioritize an App Store presence, regardless of the backing programming language. Looking to make an iOS app? Head over to our functional app templates and publish your app today.